Reminiscent of David Bowie's Ziggy Stardust and more entertaining than the Rocky Horror Picture Show, Hedwig and the Angry Inch is a non-stop provocative rock musical like no other. 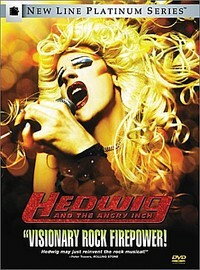 Formerly Hansel, Hedwig (John Cameron Mitchell) is a self-proclaimed "slip of a girly-boy from communist East Berlin." After moving to Junction City, Kansas, Hedwig starts to write and sing some fantastically tragic rock songs with his/her backup band, the Angry Inch. The songs are a myriad of different musical elements, nicely incorporated into a twisted barrage of emotional humor. "Origin of Love" is based on one of Aristophanes' tales about how love came into being. In this song Hedwig puts a fresh perspective behind the age old concept of a "soul mate". The romantic notions of a perfect "other-half" are swept away to make room for some slightly cynical questions that permeate the entire movie. In the end, Hedwig learns some of the hardest lessons about love for one's self and others. The New Line Platinum Series DVD offers some great features for after the film. It boasts a feature length documentary about the story of Hedwig, a filmmaker commentary, deleted scenes, and a song-by-song access to the film that will take you to any song in the movie. (I use the latter feature the most often.) This movie is not for somebody that is uncomfortable with their own sexuality or gay or lesbian culture. The story is something that everybody can relate to regardless of their sexuality, but it still makes some people squeamish to see a man in a skirt. Feature Length Original Documentary, "Long Story Short: The Forging of a Cult Legend from Stage to Screen"